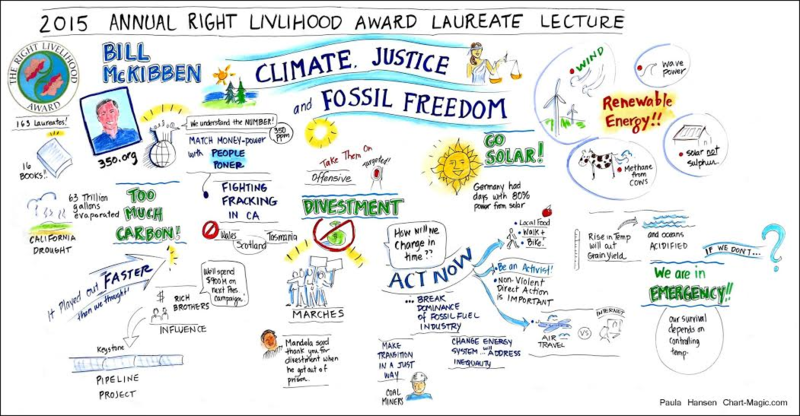 On February 26th 2015, UCSC Kresge College had the great honor of hosting Laureate Bill McKibben through a Skype conference call. The event brought together roughly 200 students, faculty and community members. Students involved in a University of California wide fossil fuel divestment campaign introduced Bill, and divestment was a major theme of Bill’s talk. After Bill’s keynote, we continued with interactive exercises using The Work that Reconnects, a World Cafe conversation, and dinner. Bill’s skype visit was the second Right Livelihood Laureate Lecture at UCSC, the first being Wes Jackson’s address last April. The recording of Bill’s talk has yet to be edited, but will be shortly. Included below are graphic recordings of Bill’s talk, as well as the discussions that followed.